You're a sports fan. You know that The Derby is a big deal, only because you have always been told that it is really important. But what's the big deal? You don't really get it - to you it's just a horse race like any other, because no one has ever taken the time to explain to you WHY it is so celebrated by the horse racing masses. That's where I come in. The 1st 2nd 3rd 4th of several installments. Horse races are like snowflakes: they are each unique although they may look different. Here we are going to look at how a race unfolds, and how that is affected by the size of the field, the running styles of the horses involved, and the pace of the race. Outside of the Derby, you will rarely ever see a horse race with more than 12 or maybe 14 horses in the field. 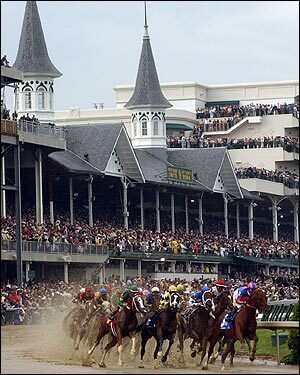 The Derby almost always has the maximum allowable 20 horse field, mainly because it is such a big deal that any owner who can take a horse to the Derby will do so even if they know in their hearts that their horse probably has no chance to win. With Charismatic winning in 1999 at 31-1 and Giacomo in 2005 at 50-1, it looks like the Derby will have the maximum field for a long, long time. A 20 horse race is pure chaos compared to one with a dozen entrants. There are lots of traffic issues, especially out of the starting gate and around the first turn as horses are jockeyed for position that suits their running style and strategy. I would guess that in these 20 horse Derbies, by the time the horses round the 2nd turn and start down the backstretch nearly half of the field has lost their chance to win because they have been bumped, cut off, forced out wide, etc. One thing that almost every Derby winner shares is a perfect trip, but it is impossible beforehand to know who will have traffic problems and who will get a good trip, which makes handicapping difficult and general viewing intriguing. In addition to field size, pace plays a huge role in determining how the race "unfolds" as well as which horses have a chance top win. Different horses have different running styles, and basically there are three: speed horses who run in front and "need the lead" ("frontrunners"), horses who sit off the leaders pace ("stalkers") and then make their move on the far turn, and horses who start off slow and way behind and make a huge kick at the end to rally ("closers" or "bombers" who are said to like to come "off the pace"). Each horse will have a better or worse chance to win based on how the race unfolds with regard to pace. The more horses are in a race the trickier it becomes to handicap, because there are many more possibilities as to how the race will unfold. For the purposes of this discussion, let's say that the "average" pace for a mile and 1/4 race is fractions of :24, :47, and 1:11 (1/4 mile, 1/2 mile, 3/4 mile respectively). Here's how races develop differently. The speedy, frontrunning horses go to the lead and set the pace, the stalkers try to lay off them just a bit (called "rating"), and the bombers go intentionally slow and are far back in the pack. Then one of three things happens. 1) If the speed horse on the lead goes too fast, then he at a minumum tires himself out and fades somewhere between the 3rd turn and the turn for home, and at a maximum he also burns out the other frontrunners as well as the stalkers. This is called a fast or hot pace, and it sets up beautifully for the bombers, who sit back, allow the fast pace to tire out the speed horses, and then use a late big kick or rally to pass lots of tired horses in the stretch and "pick up the pieces" as they say. The faster the pace, the tougher it is for the frontrunners and stalkers and the better it is for the bombers. Take last year's Derby. A speedball named Spanish Chestnut was entered in the race, and really had no business being in there because everybody knew that this horse was a sprinter who should be running at a mile or even less because he couldn't "get the distance". Anyhow, Spanish Chestnut went out and ran the some of the fastest fractions in derby history, something like :22, :45, 1:08. This served to really cook the other speed horses and stalkers in the field. They all got tired, and "closer" & 50-1 super longshot Giacomo benefitted from the insane pace and passed them all to win the Derby (Closing Argument, another bomber, finished 2nd at 71-1). Many people, including myself, consider his victory flukey on account of how the race developed, and we point to the fact that Giacomo had not won a graded stakes race before the Derby, nor has he won one since. A very similar scenario played out in 2001 when Songandaprayer ran similar insane fractions, cooked the field, and Monarchos rallied past the tired horses to pick up the pieces and win. 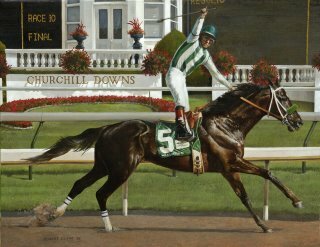 Monarchos never won another race and history views both him and Giacomo as Derby Champions but not great Derby Champions. 2) The speed horse on the front is able to run less than all out and lull the horses behind him to sleep a bit. If a front running speed horse can get "loose on the lead" and run moderate to slow fractions thereby saving energy and leaving gas in the tank, then that horse will be awfully difficult to catch when all the horses make their moves in the far turn, and has a really good chance to win the race. This is called "wiring the field" or winning "wire to wire", and although rare, it does happen (Winning Colors 1988, War Emblem 2002). In 2002 everyone knew that War Emblem would go to the lead, but the other horses kind of assumed that other horses would challenge War Emblem into a speed duel. Well, they all fell asleep at the wheel, War Emblem got "loose on the lead" and ran moderately slow fractions (I think :23.3, :47.0, and 1:11.8) and still had plenty in the tank to easily hold off everyone else when they made their moves and win wire to wire. War Emblem, 2002: Loose on the lead, wired the field. 3) The pace is fast but not insane, and the leader tires himself out and sets the race up perfectly for the stalkers who have sat off the lead or even a bomber who makes a massive move and comes "flying late". This is how 70% of Derbies unfold - very fast pace, stalkers or closers make their move around the far turn and/or at the top of the stretch and come home to win. So with a full field of 20 horses, several of which each belong to different running styles, and no way to know how the race will develop pace wise, how the hell do you pick a winner? At this point, the possibilities are infinite. Welcome, my friends, to the wonderful wacky world of Derby, where literally anything can happen.